With more than 85 years of audio innovation on the books, it’s hard to think of something that industry mainstay Shure Incorporated hasn’t done. 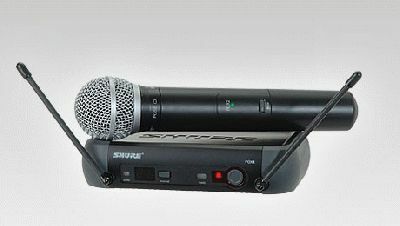 But today Shure is introducing the first digital wireless microphone system in the Company’s history. The PGX Digital Wireless System is designed for users who demand uncompromising sound quality, operating simplicity, and the rock-solid durability for which Shure is famous. Shure PGX Digital Wireless adds the clarity and precision of 24-bit/48 kHz digital audio to the proven reliability of analog PGX wireless products. PGX Digital combines superior digital sound, extended battery life, and the convenience of the 900 MHz band with the user-friendly simplicity that has made PGX Analog a perennial favorite. Like its analog sibling, PGX Digital offers a wide range of system configurations for vocalists, guitarists, and presenters. Handheld systems have been designed specifically to match the unique sound signatures of trusted microphone options like the cardioid SM58® and supercardioid Beta58A®. . Instrument systems come with either the Beta98H/C clip-on instrument mic or the WA302 guitar cable. Presenter systems include either the WL185 cardioid lavalier, WL93 omnidirectional lavalier, or PG30 headset. All systems ship with the PGXD4 diversity receiver and a padded carrying case. Shure PGX Digital Wireless systems will carry a two-year limited warranty and can be purchased at select retail partners. Visit www.shure.com for a list of authorized dealers.